I recently saw I’ll See You in my Dreams, and I have to say that I was pleasantly surprised. I typically think of Danny Thomas in comedic roles, but he plays the role of famous lyricist Gus Kahn very well, and Doris Day does very well as his wife, exemplifying the idea that “behind every great man is a great woman — pushing.” I’m aware that Hollywood biographies need to be taken with a large grain of salt, but like the similar musical biography Three Little Words, I found myself enjoying the film very much — and I hope that you do as well. 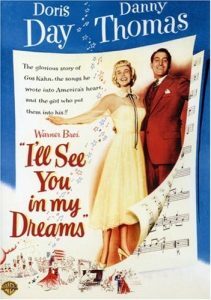 Hollywood’s tradition of composer biographies is a crowded (and heavily fictionalized) subgenre, but make room for I’ll See You in My Dreams, an enjoyably low-key account of the life of lyricist Gus Kahn. Danny Thomas, in one of his rare big-screen leads, plays the scrappy writer, and Doris Day plays wife (and sometime collaborator) Grace LeBoy Kahn. The film has the customary rise-and-fall of a showbiz career and marriage, with a couple of standard-issue conflicts thrown in: Kahn is tempted by the glitz of Broadway and the appeal of a shapely diva (Patrice Wymore), becomes depressed over a dip in his popularity, and is embarrassed by his wife’s decision-making (Grace comes across as the Yoko of the era — although the movie endorses her bossy approach). Director Michael Curtiz, who had a lot to do with Day’s early movie career, imparts an elegant look to the black-and-white interiors, and he fully embraces the cornpone twists of the story. Doris is Doris, and although Danny Thomas doesn’t prove himself a great movie presence here, his offhand style wears well. But there is one huge reason to watch the movie, and that’s the soundtrack, which brings home just how much Kahn was the lyric voice of the 1920s, the tunesmith for the F. Scott Fitzgerald age. Doris Day and Danny Thomas recorded a Columbia 10-inch LP featuring eight film songs which climbed to number one on the Billboard pop albums chart.